See my post from Day 2 – starting to use Cloud Services. I recently moved into a new home that uses electric heat exclusively. Having come from a natural gas forced air furnace, I wasn’t sure what to expect in terms of cost. I used to just keep the thermostat at 20C and forget about it. After hearing some horror stories about $800 electricity bills for heating this place, monitoring it became a little more important to me. So, I ordered an energy monitor. 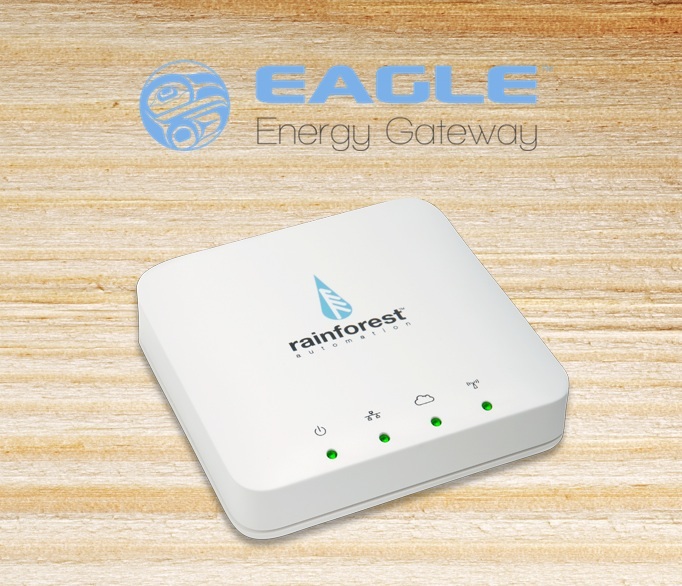 BC Hydro helps provide a discount to get an Eagle system from Rainforest Automation, pre-programmed for your meter. It arrived in a box today. Here’s what I was able to do with it out-of-the-box and how I’ll be using it in the future. In my next post I’ll talk about how I connect it to some cloud services and see what they provide. In the end, it is ultimately an open platform and boasts a REST API and developer documents that I’ll be digging into. They communicate wirelessly using a Zigbee compatible protocol. So the Eagle monitoring unit is capturing data from that broadcast (the current meter reading counter) and storing it on the device with a timestamp. This leads to some other questions as well, especially for the DIY device hacker. Are there other ways of capturing that data without Zigbee – i.e. optical? I think there are but haven’t investigated it much as this option was pre-configured and not horrendously expensive (~$60) for getting an embedded system with web server, Zigbee and more (can’t wait to hack this sucker!). Does the meter actually store any historical data? I’m hoping to find out, but I believe that all it spits out is the current meter counter, so it doesn’t matter if it misses a bunch of transmissions, it will correct itself later on. Can I read my neighbours? Looks like you need some special ID numbers generated from a hydro service account to access the meter, so I doubt that I’ll be trying it on others. After plugging it in and hooking it to an ethernet cable to my router, all the green lights came on except the Cloud light (as I hadn’t configured it yet). The unit had a label on the underside with the name of the device as it would appear on my network eagle-xxxxxx.local – I just checked my router and used the IP directly. First they tell you to go to their website and enter in a few codes from the label. I didn’t get too far with that until I actually powered off the device once and restarted it. Then I could hit the host/IP and start using it right away. I did send a support request to them mentioning some of these issues and they actually updated their docs, so be sure to communicate early if you are working through a similar scenario it yourself. The Eagle unit runs a few services, e.g. the RESTful interface and a web server that you can hit directly when plugged into your local network. The main part of the UI I’m interested in is a usage History graph, showing hourly, daily or weekly usage. It also has a download feature so you can get a CSV text file showing the same data. I’m not sure yet how much data it will retain, guess we’ll find out tomorrow. The only bummer I noticed with the cloud services so far is that, at least with the one I’ve tested, it only works when a web connection is online. Although the monitor will continue to store data and you can view it in the devices history chart, it does not re-send records to an external service after a network failure. So, if you are like me and want to even shut down your Internet at night to save energy, just don’t expect to gain all the benefits. More on that later. Until then, I’ll be leaving it all on so we can see how things go. My next planned steps are to get a baseline for my energy usage during the day. It’s actually pretty easy for me to see how it’s going throughout the day as I work from home and several of us are in the house all day long. It’s pretty cool so far to see a spike go up when heaters turn on or the hot water is getting low. Although I’m going to try to get my energy bill down, I’m still amazed at how cheap our power is, especially relative to those in the world who don’t have access to any. So if I look like I’m out of touch trying to save a few cents a day keep in mind, I’d pay 10x my current bill before I gave up my clean, hydro-generated, renewable power in place of a dark hut with a dung fire! I’m very thankful I can even run these experiments. More to come in Day 2 – as I enable a cloud service to help me make sense of my data. Hi! My Rainforest Eagle does not have the Bidgely Inc. cloud URL. Can you tell me what is the full cloud URL from the picuture above. https://api.bidgely.com/v1/users/… Thank you. You looking for https://home.bidgely.com/dashboard ? energy saving is small change in our routine life. Perhaps when making tiny incremental changes in the average household, but over time it does add up especially in geographic areas that get blazing sun or horrid winters. If none of my appliances were higher efficiency I know I’d be paying significantly more. Thanks for reading!